Information from Africa Geographic and the Nama Karoo Foundation. You can also join the Karoo Blue Cranes Facebook Group to stay up to date and see and learn more about the Blue Crane in their natural habitat. You may have read about the blue crane massacre in the Karoo earlier this year, which saw the poisoning of what is estimated to be in excess of 200 blue cranes near Richmond in the Northern Cape. Following this terrible tragedy, a post-massacre census of blue cranes in the Karoo is desperately needed. The poisoning of blue cranes was first reported in 2012 when a family of seven birds were found with poisoning symptoms, such as curled feet and pulled up legs; however, the scale and use of poison was not fully uncovered and understood until early 2015. The Animal Demography Unit based at the University of Cape Town conducts a bi-annual Coordinated Avifaunal Roadcount (CAR), which is a bird count that takes place along fixed routes. The blue crane counts conducted in the High Karoo Park, which is adjacent to a farm where questionable agricultural lands were developed, reported 2,000 blue cranes in winter 2010 with a drastic drop in 2014 to just 450 birds. 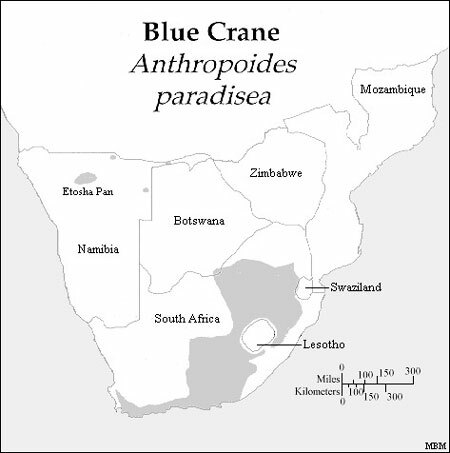 This mass destruction of South Africa’s national bird comes as a massive blow to the Karoo, particularly the town of Richmond, which was due to host the Birds of Paradise Festival in April this year and was busy establishing itself as the ‘Blue Crane Capital of the World’. The Nama Karoo Foundation has been working tirelessly for over a decade to protect a declining population of blue cranes. The reason why blue crane numbers should have crashed to this extent remains unclear, but it appears to be a combination of issues. The loss of habitats, poisoning and collisions with power lines and fencing are likely to be major factors. 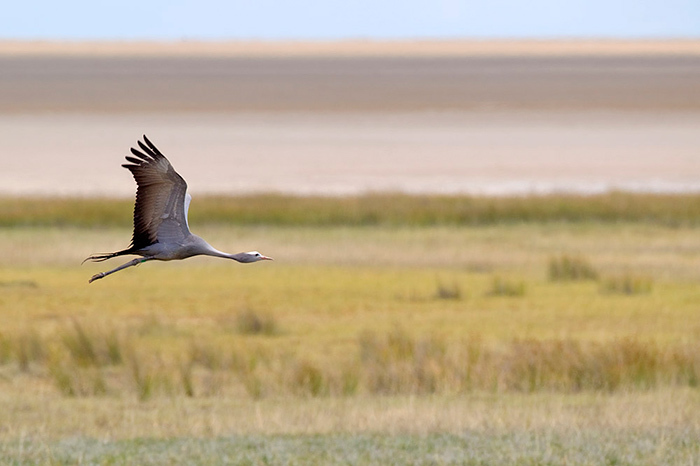 More research into the lives of blue cranes and their conservation is urgently needed. 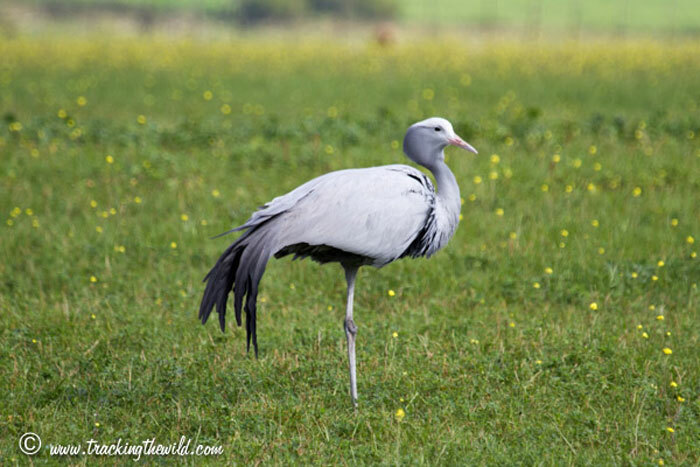 Although the lowland Karoo plains around the Camdeboo National Park in Graaff-Reinet hold populations of blue crane, most of these birds appear outside of protected areas, so it is even more important that they are safeguarded. Most conservation efforts are by farmers who need to be applauded for their commitment to the preservation of the blue cranes. 1. Download the Android or iPhone app or create a free account on the website. 2. 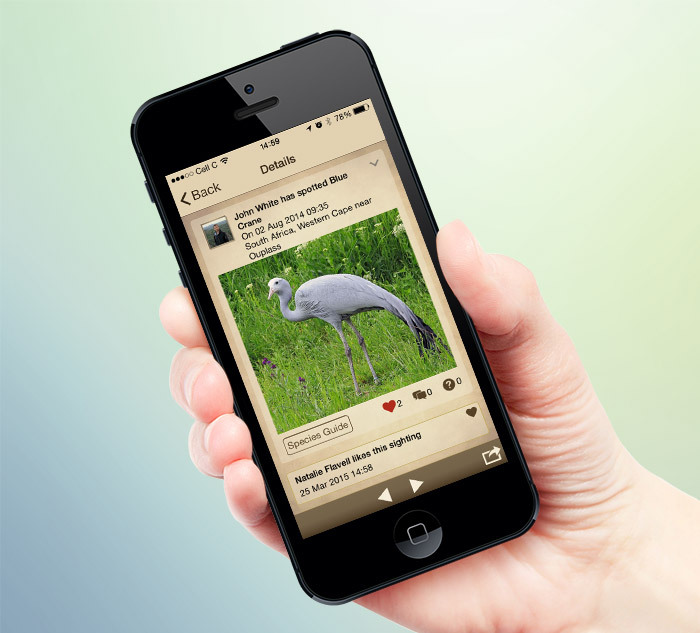 Upload your sighting of the blue crane(s) and mark the GPS location on the map. If you’ve taken the photo with your smartphone or a GPS-enabled camera then the location will populate automatically. If you didn’t manage to get a picture then don’t worry, the sighting is just as important! 3. Mark how many birds you saw as well as the date and time. 4. The data will automatically be submitted to the Nama Karoo Foundation and the Animal Demography Unit so that they can use it for their research. 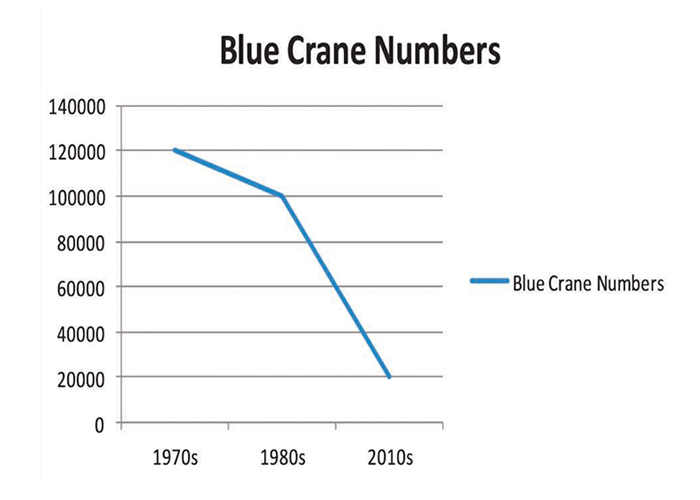 Today, there are less blue cranes left in the wild than there are rhinos. Around 20 years ago there were about 100,000 whereas today there are around 20,000. The only other population outside South Africa occurs in the pan area of Etosha National Park and the Caprivi Strip in Namibia, where many of the 60 birds are now missing according to Mike and Ann Scott. We therefore urge you to get involved in assisting with this enormously important blue crane count, both nationally and in the more remote Karoo, so that we can ensure a future for this magnificent national bird of which we as South Africans are now responsible.